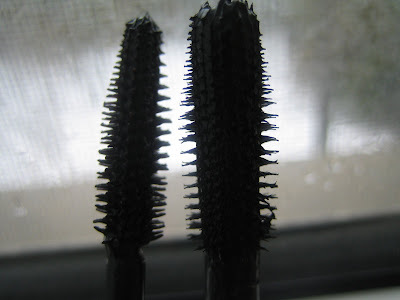 Here’s a picture of the wand that makes Cover Girl’s mascara, Lash Blast, so intriguing. It seems to use the same spiky bristles as the newest mascaras but the wand is huge! The small wand you see on the left is the one for Volume Exact. See how much smaller it is? I usually don’t like mascaras with fat brushes. I find them to be unwieldy and I inadvertently get mascara on my eyelid as I try to negotiate mascara on every part of my lashes. That said, this mascara is really good and it does give me long full lashes that are slightly curled as well. I would even say that this is one of the best mascaras of the year and if you’re looking for a mascara that delivers and you like the fat wand mascaras, then this is your best bet. $7.49 at drugstores and mass merchandisers.